People living in Finland and Sweden already know it – sauna therapy is a wonderful way to reduce anxiety and stress, while promoting relaxation, contentment and peace of mind. However, saunas and steam-baths are much more than just leisure products. Other health benefits of using sauna include muscle relaxation, detoxification and glowing healthy skin. The tradition of sauna stems from the centuries old ritual of cleansing the body and the soul. Routines vary, but the basic idea is simple: sitting in the hot room, which is typically warmed to 80+ degrees Celsius. After 10-20 minutes – just when the heat becomes uncomfortable – it is customary to jump into a lake or swimming pool or to take a shower. After a short rest one goes back to the hot room and begins the cycle again, according to their personal preference. Sauna works on the principle of generating abundant sweat to detoxify the body and relax the mind. Glowing healthy skin – blood flow to the skin increases during a sauna session. With more essential nutrients being available to subcutaneous and surface tissue, the quality of the skin gradually improves. Detoxification – the heat releases poisons and heavy metals beneath the skin so that they can be purged through respiration. In this day and age most people are exposed to toxins every day. Toxic chemicals are abundantly present in our food and environment, so it seems reasonable to aid the detoxification process with the regular use of sauna. Hyperthermia – exposure to the high heat creates an artificial fever state. Fever stimulates the body’s natural healing process. As a result, your immune system will produce greater numbers of disease fighting white blood cells and antibodies to eliminate viruses and other pathogens. Furthermore, sauna therapy relaxes muscles and inhibits sympathetic nervous activity. Regular sauna users say that a “good sweat” provides and opportunity to indulge in positive thoughts and escape from everyday troubles. If you are in reasonable health, the benefits of sauna and steam-baths far outweigh any hazards. Follow the aforementioned guidelines and include sauna as part of your lifestyle. You’ll experience a level of renewal that is hard to surpass. The all New iTouch Controller has a beautiful new refined design with a modern look and just 7.86mm thick with color touch screen and user friendly design! We’ve improved the timer function which now allows you to program 7 days in advance. We’ve added the Bluetooth music control on the iTouch Controller, so now you can skip to the next song on your playlist and increase or decrease the volume right from the iTouch Controller. Turn the lights on/off, change the RGB LED light color, increase or decrease the temperature or even increase/decrease your steam time, it’s now so much more convenient. To add to that we’ve also added user profiles. So you can set your own temperature and sauna time and another for another family member. Temperatures can be set from 25 to 110 degrees centigrade and time duration of 30min to 20hrs. The all new iTouch Controller, Our best design yet! Set the mood in your sauna with our LED lighting. Choose between different colours for special occasions and to match the interior of the sauna. 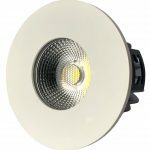 New Recessed LED Light, IP65, 10 Watt lamp. Recessed designed ceiling mount for architectural integration. 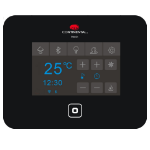 Designed for sauna room moisture and temperature levels. Energy efficient, less expensive to operate. Now you can enjoy your favorite music while you enjoy your steam sauna. Connect you iPod, iPhone, iPad or any other Bluetooth device and stream your favorite music to your sauna room speaker. It's that simple! The Bluetooth Speaker is specially designed for sauna use and is fully water resistant. 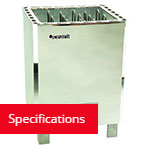 Our Sauna Heaters have been manufactured from high quality materials and finished off in beautiful polished stainless steel. 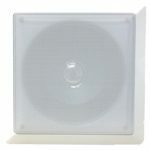 suitable for domestic or commercial duty and are supplied complete with iTouch control. A range of modern designs to suit your style. 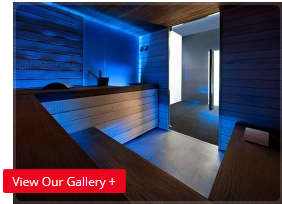 As well as LED lighting to set the mood in your sauna. 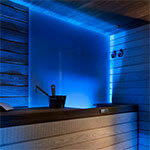 LED lighting is available in different colors for special occasions and to match the interior of the sauna.